The Refuge, a house of worship based in Kannapolis, NC, installed LynTec's RPCR relay panels as part of its state-of-the-art sound and light systems that turn sermons, concerts, and other church events into immersive audience experiences. LynTec is a manufacturer of customized electrical power control solutions for professional audio, video, and lighting systems. Featuring remote control capabilities, LynTec's RPCR-48 and RPCR-24 provide remote sequencing capabilities to the house of worship's light and audio systems, without the need to redesign the church's current system. To add simple remote sequencing and control, easy status updates via the Web, and the ability to power down equipment completely to the Refuge's new Kannapolis campus features, integrator WAVE turned to LynTec's award-winning RPCR-48 and RPCR-24 relay panels. Featuring a built-in Web server to bring remote electrical control to any large assembly space, the RPCRs add easy branch circuit control and monitoring to any existing breaker panel regardless of brand, make, or model. 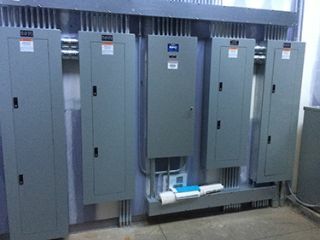 "The Refuge was looking for a power management solution that could add the ability to sequentially power down the facility's surround audio system, HD video components, and concert lighting in order to protect equipment from potential damage and increase the longevity of their systems' use," said Justin Hames, director of engineering and modeling, WAVE. "By integrating LynTec's RPCR relay panels, the client can now turn systems on and off without any risk to equipment performance, while adding the capability to monitor the status of panels easily from the Web. The result is both intelligent power protection and advanced monitoring capabilities from any Web-enabled device." LynTec's RPCR panels add easy on/off control to any existing circuit breaker panel installation and are compatible with popular control systems such as ETC, Creston, and AMX. In addition, the units offer the ability to control relays directly via TCP/IP, DMX, RS-232, or contact closure control systems. Featuring brownout protection, RPCRs will automatically shut down selected circuits during under-voltage situations and power-up as programmed when voltage regains stability. The units also provide emergency power-on for egress lighting and shutdown capabilities for amplifiers with contact closure inputs from fire alarms. Thanks to the RPCRs' built-in Web server and browser-based interface, users can simply set up, troubleshoot, control, and monitor relay status remotely. Further, the system keeps users aware of any potential emergencies by sending alert notifications via text or email to warn of voltage anomalies. "The ability to power down equipment sequentially provides both fail-safe protection against potential damage and the ability to bring greater energy-efficiency to large A/V/L installations through the elimination of phantom power," said Mark Bishop, president of LynTec. "Designed specifically for houses of worship, schools, performing arts centers, auditoriums, and other large assembly spaces, our award-winning panels allow The Refuge staff to control power remotely from any smartphone, computer, or tablet device to add another level of protection to their investments. We are extremely pleased to participate in such an innovative project; it provides the perfect example for demonstrating the flexible potential of today's power management technology."